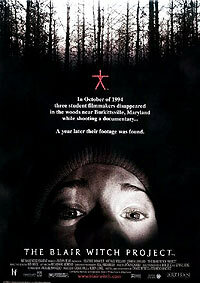 In 1999 this young group of filmmakers turned the horror genre on its head with a very innovative approach. At this stage video was still not accepted as a 'serious' filmmaking format. 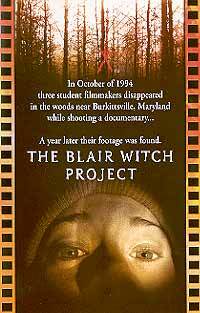 What these guys did was use video and 16mm to construct a story of a student film crew heading out into the woods to document the legendary myth of the so-called Blair Witch, who reportedly killed many people and was never found. This crew actually goes missing in the woods. Along the lines of the appalling Cannibal Holocaust, they use the device of the team's discovered footage ayear later, which reveals the fate of the people involved. 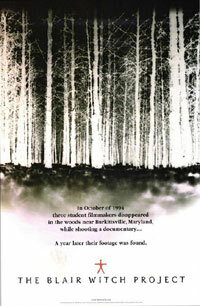 The natural acting and handheld cinematography add to the documentary feel, which was utilized in the publicity to have viewers believe it is real and not fiction. Many people actually did fall for it! With a successful Internet campaign and a great fake separate docy screened on TV (that some feel is superior to the movie! ), the young moviemakers struck a hit with this impressive debut that uses suggestion, sound and raw emotion to strike terror into their audience.